Maybe you should take a moment to guess what it is, or reflect on it if you know its identity straight away. Groundsel. That's what it is. 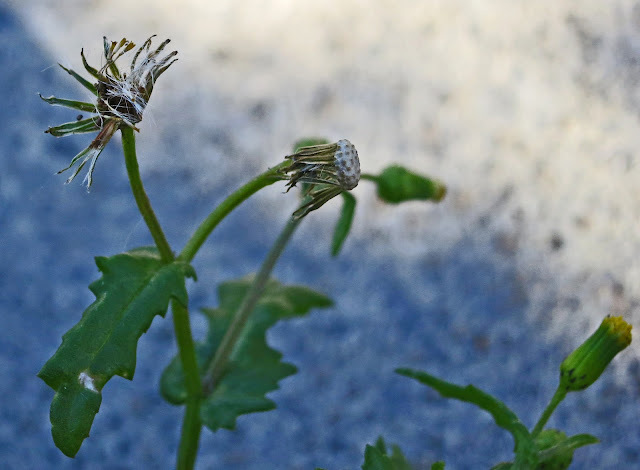 Groundsel in a kerb. Below is a picture of the same plant. The top left of the plant is what's shown above. In it you can see that the background is blue because it's in the shadow of a kerb and a garden hedge. So what is the significance of this picture? One is that it explains why my posts have become a little erratic. Each week I gather so many hedgerow pictures I find it hard to decide what to put on the blog. I'm not weary of hedgerows. It's that I don't want to weary my readers. After several years of Loose and Leafy, I don't want you to say 'Oh no! Not another hawthorn post!' 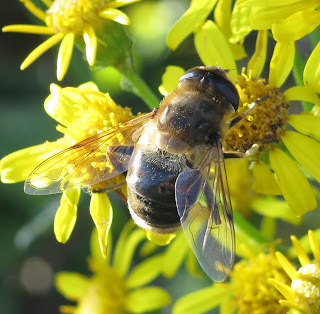 or 'For heaven's sake, we've seen ragwort / chicory / dandelions already. Indeed we've seen them over and over again. Give us a rest!'. This is the trouble with seasons. They tend to come around a lot. 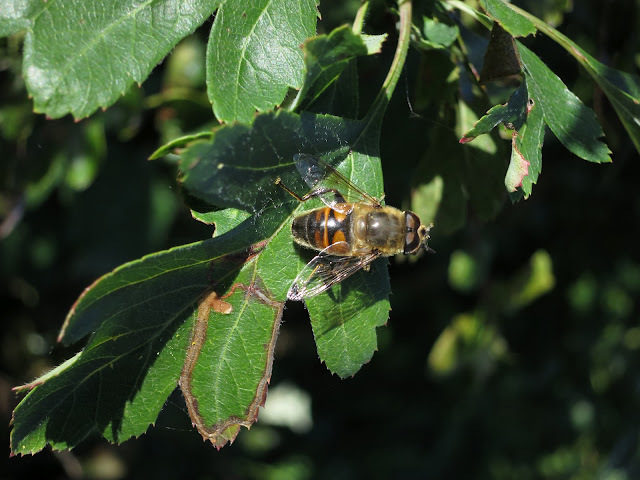 So I've been looking closer - and have become entranced by hoverflies. I'd thought they were all the same. They aren't. They are dramatically different, one from another. This is getting nearer to the point. The closer you go, the more you see. Back to the groundsel. 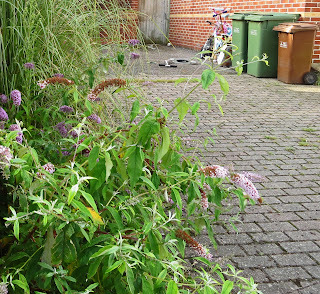 My neighbour (Esther Montgomery) and I have been working on a project about urban wild plants. * I've been looking at the streets. She's been letting plants arrive in her garden by chance - seeing what happens. Of course, everyone knows what happens if you do this; the place silts up with weeds. And that is what has happened. I can see her garden from my window and to distant eyes it is, indeed, a mess. But the longer she leaves it, the more interesting it will be. Weeds need a few years to settle in, find a balance. Maybe they need protecting from bullies like blackberries but, apart from that . . . In the streets, I've mainly been interested in finding out what's there. There's a lot. Occasionally photographs of these plants have crept into Loose and Leafy posts* but I try not to let this happen too often. I suspect most people want Loose and Leafy to show something rural, blatantly pretty. Why not? Some hardly ever get out of town. Some people have never seen the sea. But I sometimes feel that I'm straining at a leash. I want to show you what's where the cars are. What's there by the bins. So far, in the streets, I've mainly been concerned with noting, observing and doing a little loose and leafy cataloguing (and writing about it of course, but not here ). Back to the photo. I may be misjudging. I may be too hopeful that others will see through my ground level eyes. I've got so used to admiring the small, the neglected, the generally uprooted, maybe I'm putting too much weight on it. Will you - do you? see beauty in this groundsel? Please don't say, even to yourselves, 'It's all very well in the roadside but I wouldn't want it here.'. Try to set that aside. Imagine you don't know what it is. Try Stevie Wonder - Isn't she lovely? * Esther's up to 23,000 words. I have over a thousand pictures - and still climbing. She's a way to go. There will come a moment when I'll need to do some pruning! *Examples of street plants posts. Loose and leafy post about plants in a playground. Loose and leafy post about gutters and drains. Every May, the strip of grass along the east part of Toronto's Lakeshore Blvd. is a golden strip of dandelions. I say, "If we didn't know they were weeds, we'd say, 'Aren't they beautiful!'" Look, it tries to hug us with all it's vigour and then it let's his arms down. You do bring a unique perspective to the subject. 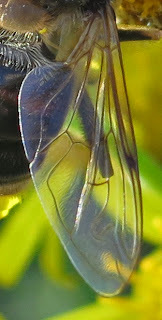 And who knew that the wing of a fly is so enchanting? Hello Helen. Dandelions are a flower I feel specially strongly about. They are truly beautiful. Hello Ellena - what an interesting image. I'd have to be very small though to fit in a groundsel's embrace. Hello Carolyn - it's one of the wonderful things about having a camera - flies rarely say still enough for us to see them properly and their wings and legs and all of them are too small to appreciate properly until very close up. The hairs round its waist are pretty spectacular too, don't you think? Yes, yes! I am a huge fan of the wildlife that exists in the interstices of human-created environments--one might argue that even that's a poor description, since it's more than the ecology is a palimpsest of environments build on and over and through one another, with human habitation and development just one layer... But I very much admire the weedy in the wild and the not-so-wild, and I'm so pleased that you celebrate it! In the end, it's your blog, your view, your life. I love that photo, you did a great job of taking something, ordinary and mundane and showing us that to look closely at the everyday will bring wonders. Hello Olivia - we agree! Hello Jen - you do something similar in your blog - celebrate ordinary things, more domestic, may be - but a spotlight on the ordinary, none the less. Ah I see you have seen the light!! Wonderful. I understand exactly what you are saying, but you are in a minority :( - when on my walks with friends they have come to accept this mildly eccentric woman with a camera that suddenly drops to her knees in adoration of Nature, be it as it was this morning a Shield Bug, even they gasp at the beauty that is often thrust into their hand for a photo. 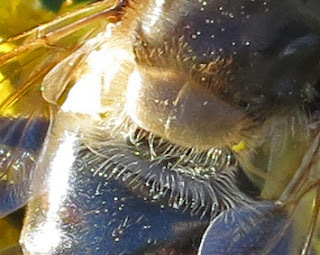 I loved your post, the hoverflies are amazing when you look at them close up like this. Your view of things must be catching, I now keep noticing all the weeds in the roads and admire their beauty! Groundsel is as you have noticed one of the many unsung weeds of our daily existence. Personally I quite like it because I noticed when I was a small boy that caterpillars lived on it and they were much more interesting. Lucy I love your blog and perspective on life and the small and unusual things. I have been like Esther allowing my garden to become a bit wild for wildlife. It is an interesting journey...so I love the groundsel...we eat dandelion greens here even though they are non-native and the early pollinators love the flowers. that hairy waist turns my thoughts to ET. I appreciate your photos, they fascinate me, and there's no way my camera would be able to capture the hairy waist either! It's autumn, not April, that is the cruelest time of year. There is something in the air that wrenches at the heart. Beauty is everywhere and yet this is a time of decay. You can't help breathing in poignancy. And perhaps, maybe, this is a clue to, an ingredient of, your love of the lone spiky weed. The plant in itself has elegance, exuberance, colour, all the attributes we cherish in other plants, but this one is an outlaw. It shouldn't be where it is. No human put it there. I think the Romantic's appreciation of the Sublime echoes this beauty/ugliness dichotomy. Oh! I'll shut up now. I've no idea what I'm talking about! But I think I understand what you feel about your groundsell image. Just can't put it into words. Beautiful photo of the sea! and I look forward to your rock posts. This is provocative, isn't it? I'm a big fan of unexpected plants in concrete, tarmac, stones and so on. What I find more challenging is plants in my vegetable patch when I want to grow stuff to eat. This was a particular problem when I was working on a community project and the park ranger let the children choose which plants were pulled out as "weeds" in the vegetable beds. The result of course was many fantastic dandelions among the brassicas. We lose that child's perspective as we try to create order in a garden, I realised. So I let one of my allotments do it's own thing, within reason (ha! there's a giveaway). Easier life, less work, pleasing aspect.